Benjamin Franklin once said, “In this world nothing can be said to be certain, except death and taxes.” As a mathematician, I would immediately dispute this – there are definitely mathematical facts it’s possible to prove beyond doubt. And this week, a committee of physicists in France have voted to make a change to the way we measure mass, which takes us a big step in the direction of certainty, making Franklin’s statement ever so slightly less true. You might think there are certain universal constants that never change – the length of a second, the weight of a kilogram, the length of a metre – and to some extent that’s true. But measuring things accurately, and being confident that your measurements are accurate, has been a difficult task for a very long time. One unit of measurement the ancient Romans used was carob seeds (the origin of the modern units carat and karat, used by jewelers to measure the weight of gemstones and the purity of precious metals) – small, even-sized seeds that had a vaguely consistent weight. But while this was accurate enough for their purposes, there was obviously slight variation in the size of the seeds, meaning their measurements could differ wildly. I’m reminded of a recent challenge in an episode of the UK comedy challenge show Taskmaster, in which contestants had to measure the circumference of a caravan in baked beans – given only three minutes, some tried to frantically lay beans out around the caravan, but one contestant cleverly measured a single bean, then measured the caravan and calculated how many beans would fit around. 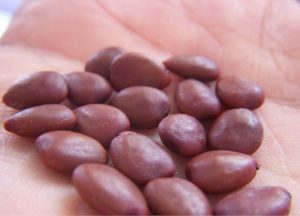 As Lucy Rycroft-Smith wrote up on her blog, this actually gave a wildly inaccurate answer, as the beans varied in size – and the one chosen must have been a bit of an outlier. Since Roman times, methods have become gradually more sophisticated. Standards were established – in England, alongside legal and judicial rules, the Magna Carta of 1215 laid out standards for measurement, and in 1266 the weight of 1lb was defined as the weight of 7680 grains of wheat – less reliant on a single variable item’s weight, but still not ideal. It took until 1791 for the International System of Units to be established – originating at the French Academy of Sciences, the Système International (SI) defined the length of 1 metre as one ten millionth of the distance from the pole to the equator, and one kilo as the weight of one cubic decimetre of water (at 4 degrees centigrade). The SI has been adopted in almost every country in the world as the standard system for measuring units: in 1875 the Metre Convention was signed by 17 countries, establishing committees and organisations to oversee standards, and the International Bureau of Weights and Measures officially established the initial six base SI units at their 11th conference in 1960. SI has since grown to encompass many different types of measurement, now based on seven base units – the ampere, kelvin, second, metre, kilogram, candela and mole. It also includes 22 derived units for other physical quantities like the watt and the lumen. However, these units still needed to be defined in a more rigorous way. The distance from the equator to the pole is not easy to measure – and such large measurements are prone to inaccuracy. Not to mention that the exact location of the earth’s magnetic poles is slowly moving! If your unit of mass is defined in terms of this – one cubic decimetre is a cube 10 cm on each side, which would change if the length of a metre varied – that will also be affected. The challenge became to find standards that continue to keep the same value independent of any changes to the things they’re based on. Some of the SI units can be defined relative to fixed values – for example, the speed of light in vacuum is a universal constant which can be measured and doesn’t change. This allows us to define the metre as the distance travelled by light in a fixed amount of time (as of 1983, 1/299792458 of a second). Similarly, the triple point of water – the temperature at which it can be a solid, a liquid and a gas depending on the ambient conditions – is used as a definition of 0 degrees centigrade, and since the kelvin was adopted as the official SI unit of temperature, 273.16 K (as of 1954). Since 1960, only one SI unit has been fixed relative to a variable physical quantity, and that’s the kilo. Another problem SI units have is the difficulty of actually measuring them. Even if you have a fixed definition of a unit – once these universal definitions for the metre and kelvin are established, you can weigh a decimetre of water at the right temperature – it’s still difficult to propagate this measurement. 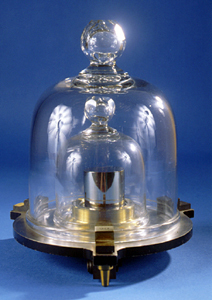 In 1889, the International Prototype of the Kilogram (IPK) was created – a 39 mm high and 39 mm wide cylinder of a platinum-iridium alloy, designed to be as stable as possible, and to be stored in a secure vault in France. There are official copies of the kilogram, called témoins (witnesses) that are stored in other locations around the world, and used as local references – but very occasionally they’re returned to Paris to check they’re still the same weight – three times in the IPK’s history. There are many problems with the official definition of a unit being tied to a physical real-world object. Primarily, if the mass of the IPK changes, that would change the definition of the mass of a kilogram to match. That means if someone were to accidentally damage it and remove a chunk of the metal, the weight of a kilogram would change accordingly – literally, around the world, people paying a fixed price per kilo for goods would suddenly find their costs increasing. Obviously, in reality it might not actually happen so quickly – but this is the official definition. Since many of the other SI units are defined based on the kilogram, the mole, the ampere, and the candela would all be affected by any change to Le Grand K (an affectionate nickname). It’s also impossible to keep the mass of a physical object constant – over time, the surface of the metal reacts with substances in the air, and particles of contamination adhere to the surface – adding up to around 1 microgram per year. The kilograms are cleaned, using a very careful specified procedure, to remove this surface contamination – and while it’s only a tiny difference, comparable to the weight of a single eyelash, this can mean the mass of the artefact fluctuates by around 50 parts in a billion. Since the ‘witnesses’, and not the actual kilogram, are used to maintain other more local standard weights, and these are each used to create reference weights for use in labs, business and industry, these tiny errors can propagate, causing noticeable differences down the chain. Alternatives to the IPK have been suggested, including a spherical mass prototype made of silicon, but these still have the inherent risks and inadequacies of any physical reference mass. So, how do we create a reference for the mass of the kilogram that doesn’t reply on a physical object? Enter the Kibble balance. Invented by Dr Bryan Kibble in 1975 (he called it a Watt balance, but it was renamed after his death), it’s used to measure the value of one of the other fundamental constants – h, the Planck constant. The Planck constant, named after physicist Max Planck, relates the energy carried by a photon to its frequency – but since energy and mass are equivalent (thanks, Einstein) it also relates frequency to mass. The Kibble balance allows the Planck constant to be measured with incredible accuracy, meaning that we can now fix its value and use that to define the mass of a kilogram. The value is now officially going to be h = 6.62607015 × 10-34 joule-seconds, as of next May, when the SI system will officially change to redefine the kilogram. The value of h has been chosen based on the current value of the kilogram, since you need to measure against a mass. But from May 2019 onwards, if anyone has their own Kibble balance (currently not a cheap option, but new designs might mean that smaller commercial versions will become widespread) they can use the new fixed value of h to get an accurate, universal kilogram – and gram and microgram, meaning the error previously introduced by using a fixed kilogram as a reference is also reduced. 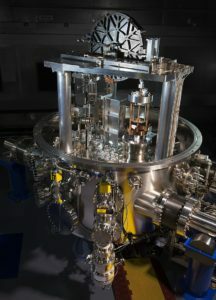 This change will mean very little practically to anyone who doesn’t work in a physics lab – the value of a kilogram isn’t going to change (in fact, it’ll strictly change even less than it usually does) – but this new definition will become the international standard, and masses will be measured and calculated relative to it. The has potential implications in many fields, from quantum mechanics to mechanical engineering. The definition of the kelvin is also likely to change – it can also be defined relative to the Boltzmann constant, measured in Joules per kilogram, and now we have a fixed kilogram that can be tied to. A vote at the general conference on weights and measures – involving representatives from 57 nations – took place on Friday 16th November in Versailles, and was unanimous in favour of the change: so it’s now official. As of next May, the golf-ball sized chunk of metal in a glass jar in France will become merely a nostalgic object of historical significance: part of the history of physics, and a symbol of humanity’s quest to measure the universe. The International System of Units ultimately refers to physical phenomena. But mathematics and logics lead the way to stripping down the dependency of these units on the physical world to the bare minimum.